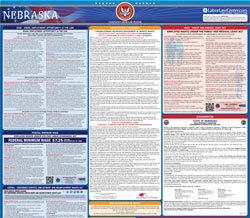 The Nebraska's Federal All-In-One Poster is a job safety law poster by the Nebraska Department Of Labor. This is a mandatory posting for all employers in Nebraska, and businesses who fail to comply may be subject to fines or sanctions. This poster must be posted in a conspicuous place where all employees will see it. this poster describes how employers are to protect their employees from safety and health concerns in the workplace as well as what penalties employers can face if they refuse to eliminate workplace hazards or other failures that are punishable by law. It appears you don't have a PDF plugin for this browser. Please see the link below to download nebraska-federal-5-in-1.pdf. •  Some state laws provide greater employee protections; employers must comply with both. speak  in private to the inspector.  Comply with all applicable OSHA standards. of  an  eye within 24  hours. place  of the alleged violations. This poster does not necessarily fulfill ALL federal workplace poster requirements for your business. The Employee Polygraph Protection Act Notice and federal poster supplements are not included. Go to www.dol.gov/general/topics/posters/ for posters, supplements, and posting requirements.